Over the past months, Michael Whan of Downshire Brass caught up with Desy Graham, Professor Michael Alcorn, Richard Evans and Mike Fowles on their thoughts on brass bands in Northern Ireland. The European Youth Brass Band is an opportunity for the top youth brass players across Europe. Northern Ireland were proud to have 3 representatives this year in Daniel Rollston (Cornet, Murley), Stephen Crooks (Eb Bass, Murley) and Matthew Brown (Percussion, Third Carrick) in Perth, Scotland. Over the coming weeks we hope to post what the lads had to say on their experience. 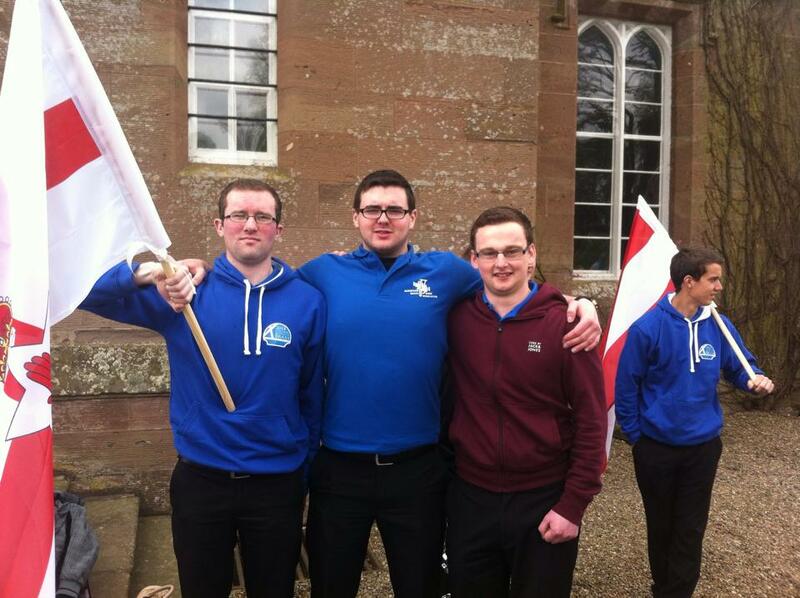 Flying the flag, Stephen Crooks, Matthew Brown and Daniel Rollston in Perth, Scotland. This years Spring Festival, hosted by the BBL, proved to be another great day of banding at the Alley Theatre in Strabane with some terrific performances and some challenging pieces. Highlights of the day were 1st Old Boys who won the Championship Section with Dessie Neill (Laganvale) taking home the soloist prize in the section. Elsewhere Third Carrick edged Ballyduff Silver Band to take the Founders Cup back to Carrick with their principal cornet, Claire Hueston, being the best of the soloists. CWA have yet another win in the third section seeing off competition from Comber Silver Band and Wellington Memorial who claimed 2nd and 3rd respectively. An all round enjoyable day for adjudicator Mr. John Berryman. The First Old Boys Association Silver Band was formed in Belfast in 1946. As its name suggests, the band was created from amongst the former members of the 1st Old Boys Brigade Company. The 1st had been the first Company in Ireland, dating from 1886, and was formed at St Mary Magdalene Church (Col), Donegall Pass Belfast. A few ex-members of the company are still associated with the band as players/vice- presidents. The band on its creation assumed instruments and music from a previous band, known as the IOR (Independent Order of Raccobites) Band. During its existence the band has regularly competed in contests both at home and in England. The band have won the senior brass section on Thirteen occasions. Other notable successes include a second place in the UK Grand Shield competition (Manchester Belle Vue, 1965), and Sixteen NI Brass Band League championships plus numerous entertainment contest and solo and quartet victories. The band draws its members from all sections of the community in Northern Ireland. Many members live and work in Belfast, while some make a round trip of over 100 miles to attend rehearsals two nights a week. Everyone gives of their time freely, as the band is a ‘subscription’ band, i.e. members pay weekly dues. Other expenses are raised through concerts and miscellaneous fund-raising activities. Stephen Cairns is the bands current Musical Director who has led the band to victory in many competitions from 2003 to present. In recent years, the band has enjoyed working with a number of visiting professional conductors including Richard Evans, Geoffrey Brand, Graham O’Connor, John Berryman, Frank Renton and more recently, Mike Fowles who led the band to victory in the 2010 NIBA Championships. Laganvale (Metal Technology) Band was formed as a Flute Band in 1908 to provide a recreational activity with a ‘temperance’ outlook for the local youth from the Laganvale area (beside the River Lagan). The headquarters of the Band was a converted dwelling in Laganvale Street and thus the band was known as the Laganvale Temperance Flute Band. The Flute Band flourished in the period following the First World War, winning the Irish Championships in 1921. The Band was a familiar sight in the many and varied traditional parades in Belfast and District during the 1920s and early 1930s. In November 1938, the Band decided to change to brass instruments and became known as the Laganvale Silver Band. Members determinately kept the Band running during the Second World War despite several members having joined the forces and the remainder working long hours to support the war effort. Early in 1942, following discussion with the Officers of the local Squadron of the Air Training Corps (ATC), Laganvale became the basis of the Band of 1136 Squadron, Air Training Corps. The ATC Cadets provided a valuable source of new players and following 6 months of hard work, the Band led the Squadron on their monthly Church Parade to All Saint’s Parish Church. Thereafter, engagements followed thick and fast throughout the Province. The band was upgraded to Wing Band of the Training Corps, Northern Ireland and performed in Scotland and England. Following the war the members, new and old, returned en masse to Laganvale Silver Band. The Band has a busy contesting programme with 5 wins in the Irish Championship contest (1968, 1972, 1995, 2004 and 2005), 3 wins in the Brass Band League Spring Festival (1985, 1999 and 2005) and numerous wins in local entertainment contests. The Band has also travelled to contests in Great Britain every year since the early 1950s. This resulted in several top placings, the best being 1st prize in the Buxton High Peak Brass Band Festival in 1999 against a strong field of 14 bands. These “away” trips have included competing in the European Brass Band Championships in Bergen (1996), Belfast (2006) and Birmingham (2007). In addition to contesting the Band undertakes an extremely busy schedule of public engagements, fetes and concerts. The senior Band is supported by the Concert Band which also takes on occasional engagements. The Band gained sponsorship from Antrim based company Metal Technology in 2004 and became known as Laganvale (Metal Technology) Band. 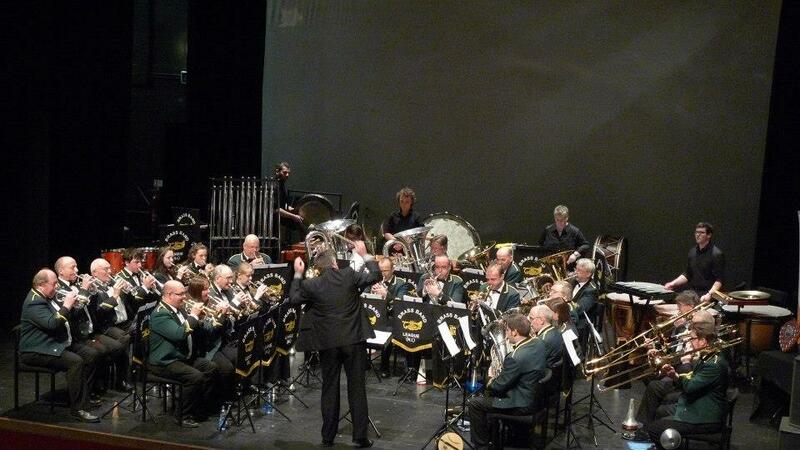 The Band was formed in 1990 by the Amalgamation of the Reid Memorial Silver Band and Hillsborough Silver Band, two of the oldest bands in Ireland at that time. The name Downshire originated from the members themselves as they wanted a new name for the new amalgamated band even though they were proud of the history of both bands. The amalgamation has been very successful and many of the band are original members. The Reid Memorial Flute Band was formed in 1912 from the members of Dr. Haire’s Bible Class belonging to Malone Presbyterian Church. It always maintained it’s link with Malone although not all it’s members were church members. The band maintained a high standard of music making until in 1933 the price of Flutes forced the members to change to Brass Instruments which meant that they had to begin again. In 1939 rehearsals and contests curtailed, resuming again in 1945 and from then on the Reid Memorial Silver Band became one of the leading Senior Brass bands in Ireland and maintained this standard for many years until the civil unrest caused the band to suspend it’s activities for approx a year. During this time members kept the machinery ticking over and the instruments, until membership had been recruited enabling the band to reform at Second Section level. The band continued to compete in contests and progressed to the Championship Section. The band carried out a busy programme of concerts and park engagements until the amalgamation with Hillsborough Silver Band to become Downshire Brass in 1990. The name “Downshire ” in Downshire Brass has links going back to Hillsborough with the Marquis of Downshire. Hillsborough Silver Band was founded in 1850 and was the Official band at the opening of the Banbridge Railway Station in 1859. The band was founded by Lord William Hills who whilst visiting his estates in England observed bands at work and decided to bring instruments back to Hillsborough for it’s own band. The band like all bands in that period started of as a flute band due to the low startup costs of instruments but progressed over the years to Brass and then Silver providing a service to the local community disrupted only by the first world war as was the case throughout the country at that time. The band held it’s rehearsals in the upstairs rooms of the old Market House (which later became the Courthouse) where it remained until the “troubles” in the Province and the close proximity to the Hillsborough Castle (where the Secretary of State for NI resided) forced the band to seek other accommodation in the village. The band carried out a great number of engagements locally and successfully contested in the BBL, NIBA and further a field over the years. Sadly due to a combination of lack of financial support and a decline in members, the band finally had to call it a day in 1990 and amalgamated with the Reid Memorial Silver Band to formDownshire Brass. The original set of instruments were bought with a loan from a Mr. Gillespie (the owner of the Valley Hotel at that time) and were delivered in a wicker basket aboard the Clogher Valley Railway. In the early years, the band only performed at local cultural events, but by the 1960’s there was huge surge of interest in participating in national contests organised by the Brass Band League of Northern Ireland (BBL) and the North of Ireland Bands Association (NIBA). The late Robert Hall was one of the key members, giving a lifetime of service to Murley by teaching virtually every playing member Murley had for almost 40 years, as well as playing himself. The late Gordon Bloomfield conducted the band from 1960 until the appointment of a local school headteacher, Jack Taylor, in 1962. However, it is fair to say that the meteoric rise of the Murley band through the sections can be pinned on one man – the late Harry Gault (right). Harry (who also founded the magnificent Strabane Concert Brass) was the conductor of Murley for 24 years, until his untimely death on April 12th 1997 at a brass band contest. Harry became the Musical Director of Murley in 1973 and the following year, the band made their first recording entitled Murley Makes Music. In 1979 & 1980 the band became both NIBA and BBL Intermediate champions and to mark the occasion a second recording was produced, simply entitled Murley in Concert. In 1981 Murley were made Band of the Yearand in 1982 they competed in the Championship section for the first time. This was held in the Ulster Hall, Belfast where the band had a commendable result, finishing sixth out of nine. In 1987 the band recorded their best result in the BBL finishing 1st in the ‘Own Choice’ Spring Contest held in Glengormley High School. The band played Tam O’Shanter’s Rideby Denis Wright. During the difficult period following Harry’s sudden death in 1997, band member Ann Bloomfield (nee Robertson) took up the baton for several months, leading the band in a memorable tour of Dublin and Bray. Mr Stephen Magee, a local music teacher, kindly stepped in as a conductor and remained in the post until September 1999. In this same month Keith Anderson was appointed Musical Director and under his guidance, the band had several excellent contest results and produced their third recording – a CD entitled And The Band Played On, which was released in 2005. .
Murley’s finest hour came in October 2007, after finally winning the North of Ireland Brass Band Championship playing Coventry Variations byBramwell Tovey – the first time in the band’s 84 year history.This acheivement, under the baton of Keith Anderson (left), meant that the band qualified for and subsequently participated in the European Championships in Stavanger, Norway in May 2008. In June 2008, Murley appointed William Hill as their new musical director and subsequently completed a historic double by winning the NIBA Championship for two years running. As a result, the band competed for the second time in the B-section of the European Brass Band Championships 2009 in Ostend, Belgium. The band finished a credible fourth out of six bands. In March 2014, after a successful weekend with legendary conductor Richard Evans, Murley became champions for the very first time at the Valley Hotel Entertainment Contest. They won Best March and soprano cornetist James Cooke picked up the prize for best soloist. The band was formed in 1958, under the direction of Mr D J McCartney, as the 3rd Carrickfergus Boys’ Brigade Band. The band went from strength to strength and won the Marching Bands Competition in Belfast three years in a row as well as featuring in the major Brass Band contests throughout Northern Ireland. The Band eventually disbanded in 1968 as the boys got older and left the BB. They reformed in April 1973 as the 3rd Carrickfergus BB and Old Boys’ Band, again under the direction of D J McCartney. This position was soon taken over by Dr R W Hylands. He was a lecturer in civil engineering at NI Polytechnic at Jordanstown. He was previously conductor of Ormeau Military Band and Templemore Avenue Silver Band, which was the top band in Northern Ireland when he was with them. In its first contest after reforming, the NI Bands Associations Championships, it took second place, then in March 1975, it won the Brass Band League (Section 3) in Northern Ireland with 185 marks out of a possible 200. It continued with its winning streak and under his direction, Dr Hylands took the Band from the Junior Section to the Champion Section with a total of sixteen consecutive first places in both Northern Ireland and Great Britain. This record is yet to be broken. The band won the highest honour “Band of the Year” in 1976. As a junior band this was a great achievement. This award was shared with Agnes Street Silver Band, which was a senior band. This was the first time a junior band had ever won this title. The win qualified the Band to compete in the Pontin’s Holiday Camp Band Contest in Southport, one of the biggest British fixtures. The Band won this competition and went on to gain second place at the National Finals in Wales in a contest with over 100 competing bands. During the year of ’76, the band also won nine entertainment contests and their conductor, Dr Windsor Hylands, won the “Conductor of the Year” award. The late 1970’s saw a large number of females entering the band. The first two ladies to join were Barbara Binding and Janice Curry (15 and 17 years old respectively when they joined). They were both made very welcome and were greatly respected for their commitment and attendance at rehearsals. Band officer Jim Simms was quoted saying, “The pair of them are just great. They don’t seem to mind at all and we’re only too glad to have them in our ranks. They are both talented musicians.” Today, there is an increasing number of females joining the band, with a current total of nine. Throughout the next few years, and in to the early 1980’s, the band took part in many concerts and public appearances, both locally in Northern Ireland and in England. Individuals and ensembles took part in festivals and competitions where they won many prizes. Frequent winners included Dean McNally, Peter Graham, Thomas Binding, Ruth Binding, Hazel Bannister, Barbara Binding, Diane Howlett and Nigel Hylands. Throughout the 1980s, the band continued with their local engagements across Ireland and although competing in local competitions they failed to achieve their previous successes. During this time the band focused on the junior members encouraging them and improving their skills and techniques. At this stage, the band had about 18 members in the junior band. 1986 saw the appointment of a new Musical Director – Mr Desmond Graham. Des had played in the band since it was first formed and often helped out by leading section rehearsals. Des led the band to victory in March 1993 when it was placed second in the Northern Ireland Brass Band Championships then, in March 1995, the band celebrated a notable championship double of the North of Ireland Band Association’s Annual Contests in the Ulster Hall. This was the second time the band had won the coveted Rose Bowl, the first being in 1976. The band has continued, to date, playing in many concerts throughout the year, particularly over the summer and Christmas months. During the summer the band hosts open air concerts across Northern Ireland and during Christmas, the band enjoys playing for shoppers in many of the local shopping centres, including Castle Court – Belfast and the Tower Centre – Ballymeana, for the arrival of Santa Claus. In addition to contesting and concert performances individual members and groups have scored notable successes in various Music Festivals throughout the Province. The younger players connected with our Junior Band have been particularly successful in these events. The band have had a long and successful history and have endeavoured to keep the fun in both the music played and in the rehearsals. This, it is hoped, will create the right atmosphere to encourage learning and the introduction of new up and coming junior members thus ensuring a healthy future for the Third Carrick Band. We hope there will be much more to write about in the future.